It’s time for me to ‘fess up to a bit of Instagram stalking. 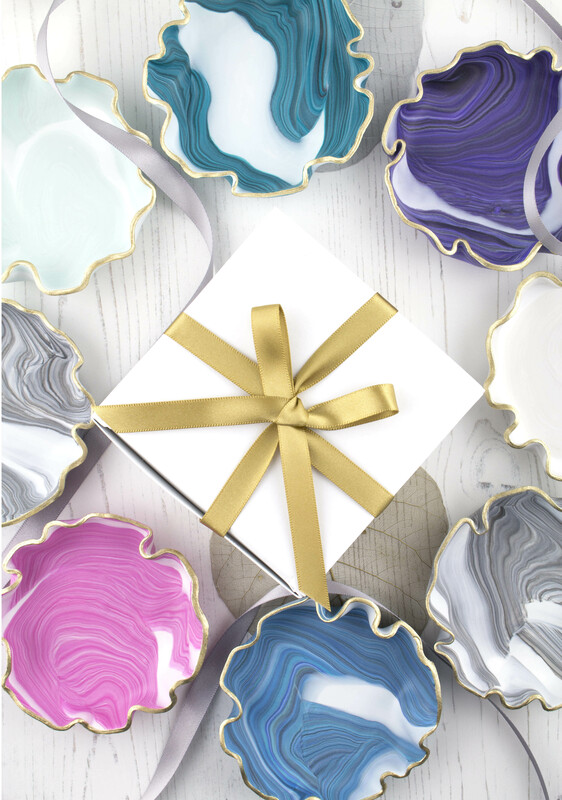 I’ve secretly been admiring the artful belle’s beautiful marbled trinket dishes for quite a while now. I mean, look at them! They’re so pretty, and the colours are just DIVINE. Each dish is a unique piece of art. So I was over the moon when lovely owner and designer/maker Rupal offered to send me a dish to include in the photos for my recent collaboration with ethical jeweller Ingle & Rhode. The dishes are designed to be the perfect size to keep your jewellery safe and tidy, so it was the perfect match. I wanted to share a little write-up on my trinket dish as I love it so much, and supporting small businesses is really important to me. I know how hard Rupal works – she’s a busy mum and runs her small business alongside looking after little one. I have so much respect for amazing mums who are running their own businesses – it’s certainly not for the faint-hearted. Rupal tells me that when she opened her Etsy shop back in December 2017, she wanted a name that sounded creative, and was a reflection of the beautiful pieces she was planning to make. And the artful belle was born! Rupal sells her trinket dishes over on her Etsy shop. She lists the colours she has available on there but if you would like a different colour, you can contact Rupal to discuss a custom order. The edge of the dish can be painted either gold or silver in liquid leaf gilding. This is fantastic of course, but it does make it difficult to choose, especially if you are terrible at making decisions like me! I asked Ethan which colour he liked best and he immediately chose purple as it’s currently his colour du jour. And by a lucky coincidence, Ingle & Rhode’s branding is purple, so it all worked out perfectly. I chose a silver edge as most of my jewellery tends to be silver or platinum. Rupal already had a purple trinket dish in stock, which meant she posted it to me first class on a Friday and it arrived promptly on Monday. It arrived in absolutely beautiful packaging. Opening a parcel from a small business is always a joy. It sounds cheesy but you can tell that they’ve been wrapped with so much love and care. I absolutely love my trinket dish. The colour is beautiful and it is just so pretty. It’s the perfect size to keep my engagement and wedding rings in. Too often, I take off my rings to do the washing up, leave them on the counter, and then forget to put them back on. They’ll be much safer now. The dish is lighter than I expected. It’s made from polymer clay, which has a super smooth feel to it. I love that every single dish Rupal makes is unique and has its own individual pattern. You can use them to keep jewellery in, or even to add some colour to your workspace – they’re perfect for pins or paperclips. They would also make a lovely bridesmaid gift. Rupal has started to make larger dishes too, as well as ring holders – you can see all her products on her Etsy shop. The small trinket dish costs £18 plus postage (postage is free in the UK if you buy four or more items). I’m pretty sure you need (at least) one of these trinket dishes in your home. I would happily have one of each! Check out the artful belle’s beautiful feed over on Instagram and I’m confident you won’t be able to resist. If you do end up buying one, please let me know which colour you choose in the comments. Disclaimer: The purple trinket dish from the artful belle was gifted to Mums Off Duty for the purpose of review. All words and opinions are my own.